I stand at the beginning of the path. The yellow brick road turned green and muddy. What will I find? I hear frogs already. It’s only March. But the warm sun suggests otherwise. Everything is so bare. The trees, the field grass. I know its bubbling beneath the surface. It has more patience than me. Spring can’t be far if I hear the mourning dove’s song. Or the wikka wee of the red winged blackbird. I have lived 64 years upon this Earth. I only hope for 64 more. There is a convention going on in the trees across the field. The tweeting of the birds mix and meld into one gorgeous wake up call. It almost sounds as if they’re all in that one tall pine tree. No sleep for a while, dear tree. What was once a cornfield is now a young woods. It’s amazing how quickly Mother Nature takes back her own. It was her world first, anyway. I’m always looking for wildlife as I walk the trails around my house. The frogs don’t count. I do see tons of deer tracks in the mushy ground, though. No llamas next door today. I dare hope they weren’t sold for human consumption. The world is what it is, though. I’ll keep positive thoughts. The trees have stayed smart. They’re not budding yet. Once the sun sets and rises, though, that may be a different story. Time moves so differently here. Oh dear — I was mistaken. Certain trees and/or bushes just can’t help themselves. Bright green moss grows on the trail. As the sun sets it’s almost fluorescent. I follow the glow. Bad storms have knocked many of the old trees over. It’s sad, really. Their once magnificent branches now are nothing more than barren tree trunks and limbs. Ahhh…but to have seen them in their glory! What tales they could tell! But they, like us, have no more tales to tell. This walk is turning sad. That wasn’t the intent. The intent was to observe. To dream. To record. But sad is the other side of the coin called happy, isn’t it? I found a golf ball on the farthest back trail. I can only imagine its story. But I shall not ask. I’ve come to a fork in the road. One trail edges the field, another meanders through the woods. Sparse the woods may be, but there is shadow here. Magic is afoot. The coolness of the woods is different from the field. Dried leaves replace the moss. The trail challenges me to follow. I cannot resist. My stories are in here. The back end of my property rests upon a barbed wire fence, which separates me from the cornfield beyond. There is nothing now except stubby stalks. But when the corn is high and full…I wrote a story about a girl who walked through the rows of corn. Walked and walked until she came upon another world. I need to finish that story. My poor broken bench. Mildewed, still standing like a bent soldier. I dragged that bench back to the edge so I could sit and reflect the world I couldn’t see. The moments I needed to see. I shall fix that old bench. There are dreams and stories I still need to see. The thistled mess across from the bench will soon bloom thick and green. Impenetrable. Protecting its children from the madness of the outside world. And I think. I often wonder if I could just give it all up. The job. TV. The Internet. If I could just sit and write and walk and write and clean house and write. Or paint. Or draw. Listen to music and just be one with the seasons. Sleep when I’m tired, move when I’m awake. If I could leave it all behind. The wind blows harder back here as it travels across the empty field. It reminds me that it’s barely spring. That Mother is up one day and down the next. The goosebumps on my arm make me agree. Up the leaf-covered path, I head towards the setting light. A slain king blocks my way, On second thought, he is too skinny to be a king. His fate was more of the knightly variety. A victim of the storm too, his slender trunk arches enough for me to pass. The rustling of dead leaves hanging at the end of empty branches sing a light and hollow song. Even in the summer. It’s like this back here. Moss is a mighty thing. It peeks through the fallen leaves and clings to the fallen tree trunks. Yet it grows. Year after year. Surface after surface. A marvelous part of evolution. As I walk I see my sitting stone jutting out of the ground. In a month I will be hard pressed to find it. But the sun is setting and the chill is following. I nod in respect to the boulder of knowledge. The setting sun is blinding me as I walk up the hill. It is as if it doesn’t want me to see where I’m going. Doesn’t it know. I never know where I’m going. I turn one last time, searching for a deer or a rabbit or a hawk or an elf. The storm made chaos out of these old woods. Branches are scattered and entwined at the end of the path. Perhaps if I were coming the other way I would see a barricade built by a dragon to keep humans out. At the end of the path on the right are several dirt mounds. Legend has it there was a house back here once, but I see no trace. But the mounds will soon be covered with daylilies. Maybe that was the mother’s favorite flower. Here lies the king. His huge trunk blocks the path. Right at the edge of the grass. Right at the edge of civilization. Part of me wants to let him rest here. He’s done his duty. I’ve come to the end of the trail. Cultivated grass leads to a house. Inside is my computer, my music. My now. Perhaps my future. 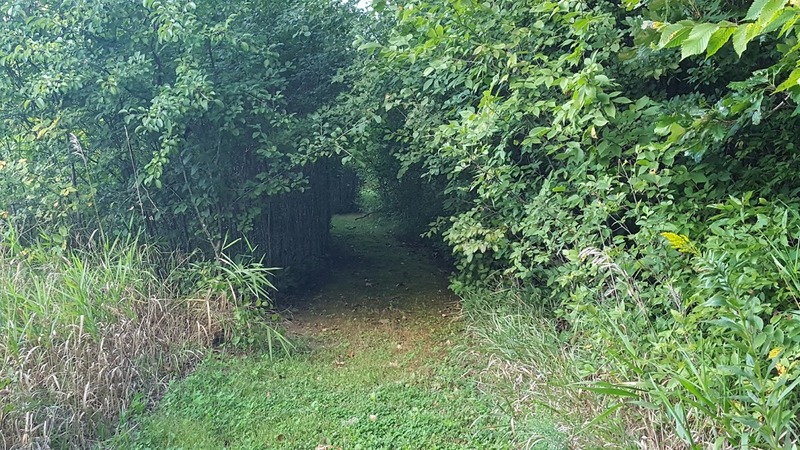 If I were to stay true to the path’s direction, I would find a whole other trail that would lead around and through the front of the property. I know the fae live there. A time warp, too. If I hold onto something for tomorrow, maybe I’ll never have to leave this world. For there will always be a tomorrow. I can live believing that. That will make two of us, my friend. And anyone else who makes it to 64! I wish 64 more for you too!